( 23rd December 2013 ) .. Ready for Christmas and the family arriving within hours and Mrs Rogers finds that the main annex door has failed ! She called Owl Locksmiths and we arrived straight away to find the mortice sash lock had failed. Unable to pick it open we had to drill and then manually pick it open. It was not the easiest job as it had seized solid but we got it open and then replaced the lock ready for the family party. 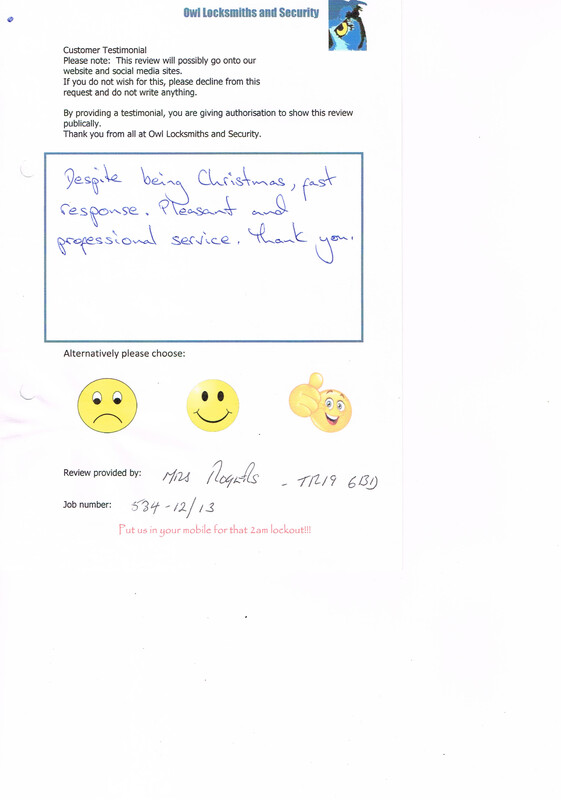 In Mrs Rogers words: Despite being Christmas, fast response. Pleasant and professional service. Thank you. No thank you Mrs Rogers and we hope that you and your family had a great Christmas after that slight hick-up. Locked out AGAIN! Is there a secure solution?